Along the Tay River toward the Perfume Pagoda. Photo by SRD. With very little international travel experience, I had a long list of places I wanted to visit. Viet Nam wasn’t on it. 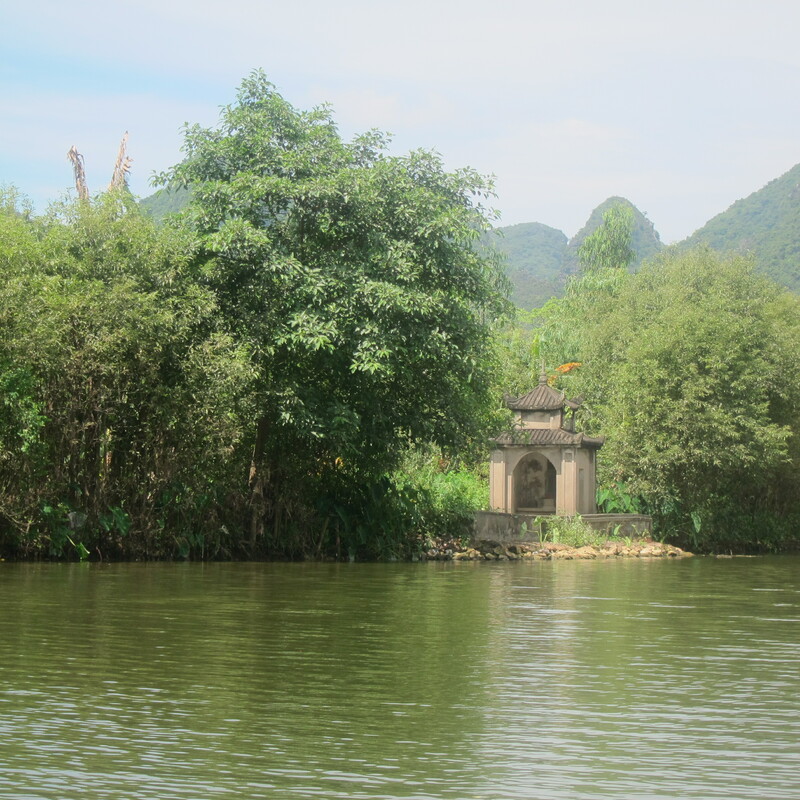 Then my friend Susan Dixon told me of her trip to Hanoi and her dream of getting a group of veterans and civilians together to tour the country. I was intrigued. I was involved in the anti-war movement and never served in the military. Yet, decades after America withdrew from Viet Nam, I still felt I had unfinished business. The war is over, and my country remains divided. I’ve heard of veterans returning to Viet Nam to heal and be healed. Perhaps I, too, need to heal and be healed. When Susan began to organize a trip to Viet Nam for this March I signed up immediately. That evening I was positively euphoric. I was going to Viet Nam! It would be a great adventure! The next morning I was more reflective. What put Viet Nam at the top of my places to visit? Gruesome images and grisly body counts dominated the evening news as I was coming of age. They’re still locked in my memory. Viet Nam isn’t like that now. It’s a beautiful country with a rich culture. I can’t forget what was. I want to go to Viet Nam to form new memories to balance the old. My friend John Fisher, a veteran who has returned to Viet Nam nine times since the war, tells me the Vietnamese harbor no animosity toward Americans. In America people are still fighting over the Civil War, to say nothing of the Vietnam War. I want to go to Viet Nam to learn from the Vietnamese how to make peace with the past. I’ve never been to Southeast Asia. I enjoy learning about cultures quite different from my own, sampling unfamiliar foods, and photographing exotic landscapes. Viet Nam will be a feast for my senses. I may even learn to master chop sticks. I want to go to Viet Nam to have fun! Life is short. If not now, when? Glad you were prompted to go. Southeast Asia is wonderful and I hope to go back. I went with John on the first trip he led. It was a wonderful enriching experience to learn about Vietnam today, reflect on our engagement in that war and it’s place in both our (USA) and Vietnam’s history, bear witness to Veterans’ return to where they had served, encounter Vietnamese civilians young and old, encounter scars from the war and new ways of coming to terms with the war…..and to see the beautiful landscape, eat the savory food, smell the scents, and encounter a welcoming country and culture…….and……and…..too much to recount quickly. Go, you will be enriched. I’m going for all the reasons you suggest and more. Thanks for the encouragement.